MANSFIELD, Ohio – The Beer Barrel Bourbon was flowing in the pits Saturday, Aug. 11 at Mansfield Motor Speedway after Cap Henry drove the Lane Racing machine carrying the company’s colors to the biggest win of his sprint car career at the 2nd Annual Great Lakes Dirt Nationals Presented by Lowes earning $20,000 for back-to-back All Pro Aluminum Cylinder Heads FAST 410 Championship Series Presented by Ohio Logistics victories. Nineteen-year-old Tyler Street earned his first every sprint car win in the JLH General Contractor FAST 305 Championship Series Presented by Engine Pro for a $2,000 payday. The win is the third overall victory in a row for Henry came into the event third in the FAST standings. “This is awesome. Thanks to Cody (Sommers, Mansfield promoter) and everyone who put this Mansfield deal together. They keep working really hard on this place and keep getting it better and better. This is a great deal. I love the Knoxville Nationals but I like 20 grand too,” Henry said beside his Beer Barrel Bourbon, Metropolitan Landscaping, UTEC, Geck Electric, J&J Auto Racing, Wings Unlimited, FK Rod Ends backed machine. “We got out front at the right time…it’s always better to not lead right away. Byron (Reed) was stuck there and Trevor Baker doesn’t have a whole lot of experience and we just went when we needed to. I have to thank the Lanes; Mike, Zack and Nick. This deal is pretty low budget and every body works really hard. This is going to be a fun night,” the Republic, Ohio driver added. Vienna, W. Va. driver Cale Conley, who scored the FAST win at Waynesfield Raceway Park last month, drove from fifth to a runner-up finish. “The car was really good…I made some driving mistakes all through the race and probably could have capitalized on the lead at some points but just wasn’t polished enough in lapped traffic. I was a little too patient tonight. I probably should have just pounded it went. I have to thank the man up stairs for letting us come out here and race and thank Mansfield for putting on a race for people who didn’t go out to Knoxville. This is very cool to have a high paying race for everyone. This is awesome. The track was really racy. Congrats to Cap. I want to thank Dave (Jessup, car owner) and Randy and everyone who makes it possible for us to come out here and do this. Second place is a pretty good run for us…we’re happy and we’re going to keep on building off of this and hopefully go get a couple of more wins this year,” said Conley beside his Merchant Services, All Star Performance, Brookville Auto Parts, Duncan Oil, RFM backed #7K. Street has been knocking on the door for a win all season and he broke down the door Saturday. Street started the 25 lap feature on the outside front row and quickly took the lead. He had to survive a few early cautions but had a dominate machine, leading every lap. The win is especially special Street as his home in Fredericktown, Ohio is only 20 miles away from Mansfield Motor Speedway. The win should propel Street into the top three of the FAST points. “This feels so good to finally get our first win. I’ve dreamt of this for so long. To get this at Mansfield, 20 minutes from home…it feels so amazing. We struggled off the start…the motor kept stumbling and I was afraid Dustin (Stroup, who won the race a year ago) would pull underneath me. Every time there was a caution it would tighten the car so much I could get a heck of a run off of two. My mom and dad…everyone did an amazing job. Dad gave me an amazing set-up,” said Street beside his B&B Drain Service, MLTW Machine & Tool, Schaeffer’s Oil, Griff’s Engines, Neil Kadey Insurance, Truform Race Designs, Greber Racing Components, Mr. and Mrs. C backed machine. Pleasant Hill, Ohio’s Matt Westfall earned the $3,000 pay day leading all 25 laps of the The Buckeye Outlaw Sprint Series (BOSS) non-wing sprint car feature for his sixth overall victory of the season. Ty Tilton got one last opportunity when the feature’s only caution flew with four laps to go. But Westfall was not to be denied aboard the Ray Marshall Motorsports machine. “The key was starting up front. In the heat race we weren’t very good but found it there at the end to get into the redraw. It’s actually kind of funny; we went up for the redraw and I had Luke Hall’s daughter draw and she drew me the one. I want to thank all the fans for coming out. The race track was great tonight; it was two grooves and you could go any where you wanted. This is a great race and Cody puts on a great event. We were here last year and I struggled so we redeemed ourselves tonight,” said Westfall beside his Buckeye Machine, DPI Ink, Crazy Lady Bar backed #33M. Four time FAST champion Byron Reed and Trevor Baker brought the field to green for the 40-lap FAST 410 feature with Reed gaining the advantage. Reed pulled away slightly while the battle behind him heated up involving Baker, Danny Dietrich, Broc Martin and Henry. The first caution flew with seven laps scored for Martin who had mechanical woes. On the restart Reed continued to lead Baker, Dietrich and Henry with Conley closing. Baker shot around Reed for the lead just before the caution flew on lap 10 for a stalled Rob Chaney. On the ensuing restart Henry drove around Reed into second with Conley and Dietrich quickly closing. Just as Henry began challenging Baker for the lead Ryan Brought brought out the caution with mechanical issues on lap 16. Baker got a tremendous restart over Henry with Conley, Dietrich and Reed staying close. With the crossed flags in the air Henry drove to Baker’s inside to grab the lead with Conley taking second a lap later. Henry caught the back of the field on lap 22 but maintained a 1.5 second lead over Conley with Baker, Dietrich and 16th starter Tyler Gunn in tow. With 15 laps to go Henry had a comfortable lead while Conley rain uncontested for second but a fantastic battle was going on for third involving Baker, Gunn and Dietrich. Gunn’s charge came to a halt with a flat tire with 10 laps to go, necessitating a fuel stop. When the race resumed Henry pulled away from Conley with Dietrich taking the third position over 13th starter Cole Duncan and 17th starter DJ Netto. In clean air and no traffic Henry built his lead to over 2.5 seconds and drove away to the win over Conley, Dietrich, Duncan and Netto. The FAST 305 A-main saw Luke Griffith and Street in the front row and when the green flew Griffith had the slight advantage until Street drove to his outside coming to complete the first lap. Griffith spun on lap four, collecting fifth place runner, Jordan Ryan. On the restart Griffith would stop again, ending his night. When the green flew once again Street held the lead over Stroup, Paul Weaver, Jimmy McGrath, Kyle Capodice and John Ivy. With laps to go Street was mired in heavy lapped traffic allowing Stroup to close but a spin by Ken Rossey brought out the final caution. Stroup made an attempt for the lead on the ensuing restart but Street kept his momentum on the high side. The mover was Capodice who utilized the bottom groove to move from fourth to second in one lap. Street was too strong though and drove to the win over Capodice, Weaver, Ivy and Stroup. The All Pro Aluminum Cylinder Heads FAST 410 Championship Series Presented by Ohio Logistics will be back in action Friday, Aug. 17 at Attica Raceway Park in Attica, Ohio followed by the series’ first ever visit to Sharon Speedway in Hartford, Ohio on Saturday, Aug. 18. There are only four series events remaining in 2018. 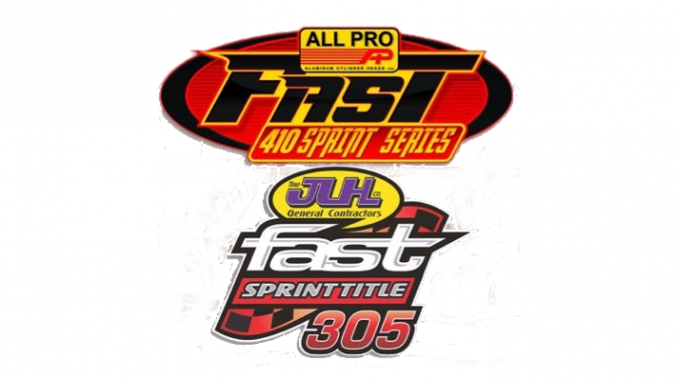 The JLH General Contractor Contractor FAST 305 Championship Series Presented by Engine Pro will compete Friday, Aug. 17 at Attica Raceway Park as only three events remain this season.